Total closed length: 44 cm / 17 inch; bead size: 6.5 mm; sterling silver group length: 11 cm / 4.3 inch. 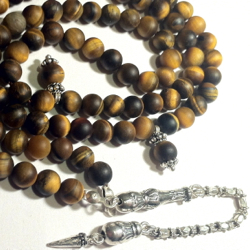 A rare stock of polished but not lustred genuine matte tiger eye gemstone is used to make the beads of this tasbih. The use of a matte tiger eye will contribute to the better evaluation of the gemstone as genuine compared to fiberoptic imitations. The lack of lustre will provide a beautiful antique appearance of the gemstone with its natural gloss upon continuous usage. Ottoman tulip symbols encircle the imame and the end bead. The hand made chain is antique and extremely rare. Well balanced, with its color and shape uniformity and professional assembly, it will stand out as one of the finest items of your collection.